The Melbourne to Port Fairy stretch is host to one of Australia’s most famous roads. The Great Ocean Road. This route tends to become a highlight, but why rush these amazing experiences! Why not take a direct route to Port Fairy, you’ll have time to soak up the beautiful beaches and suss out some local spots. 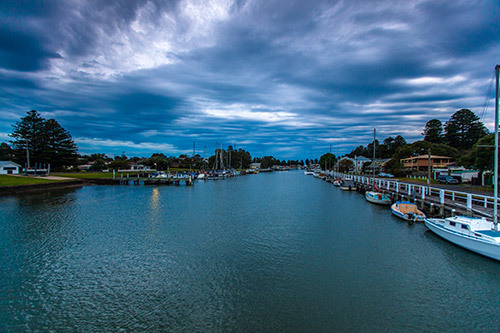 Spend an evening or two in Port Fairy and enjoy the towns amazing food. Then hit the road early next day to take the drive down the scenic Great Ocean Road back to Melbourne. Don’t forget your camera! The most direct route from Melbourne to Port Fairy is taking the M1 via Hamilton Hwy. It’s approx. 288km and takes around 3 hours. If you are anything like me, bum, legs and eyes get tired and sore after a couple of hours. A great little stop at about 2hr 20 min into the journey is Camperdown. A lovely cup of tea or coffee at the Camperdown Bakery is recommended. Not only is it good coffee but the baked treats and warm smiles make it a worthwhile stop. Once you hit Port Fairy, there are plenty of options for accommodation. Doesn’t matter how many little ones you may be travelling with or what your budget is, you’ll be sure to find something that suits. The Port Fairy Holiday park offers great accommodation with full facilities. You can grab a bargain with cabins sleeping up to 6 people for around the $200 mark. This includes full kitchen facilities, TV, aircon, bathroom etc. Want to enjoy a leisurely afternoon and soak up some sights? East beach and Killarney beach both have calm, tranquil, turquoise waters suited perfectly for young families. Or perhaps, you want to get those legs moving a bit after the drive, a little out of the town centre is an old inactive volcano known as Tower Hill. You can walk around the 4km base and there’s a great nature reserve within Tower Hill that showcases loads of cuddly animals. Soon, you’ll be looking for food. Check out Blakes if seafood is what you’re after. Otherwise, there’s Thai, Italian and some good ol’ Aussie pub grub. Pizza’s from Coffin Sally are scrumptious. Feel like you deserve a treat before retiring? Poco Artisan has delicious ice-cream. Grab yourself a quick brekky and coffee from the Farmers wife before you hit the road, it’s a great, quirky little restaurant. It’s a real local’s spot tucked into its hidden laneway. Head out along the Princes Hwy to start your mesmerising journey on the Great Ocean Road. First stop and the most unmissable part of the journey! – The Twelve Apostles. These magnificent limestone stacks impress on even the most miserable of days. You’ll find plenty of places to pull over to get a close-up view and take photos. From the Twelve Apostles, it’s really up to you. You can keep following the windy Great Ocean Road; it is, in my opinion, one of the most breathtaking drives Australia has on offer, though this will take you about 4 hours (376km) to get back to Melbourne but make sure you allow time for stops along the way. You’ll get to pass through Otway National Park as well as lots of interesting towns. Lorne is a quaint and beautiful ocean side town to stay if you want to break it up again. Keep a look out for seals! If time is an issue the Princes Highway will take you only about 3 hours (282km) to get back to Melbourne. This is one of the most amazing drives in Australia. To be able to drive at the edge of the world on top of massive limestone cliffs with the glacial blue ocean crashing at its base is truly a spectacular experience. Port Fairy and the Great Ocean Road in one trip? Lucky you I say! Safe driving!